Many work placement problems arise when the student’s expectations are not met. This may stem from a mismatch of aims and expectations between employer and student, or it may occur because the student may have an unrealistic picture of life on placement and is therefore very likely to be disappointed with the reality. Perhaps this is unsurprising when a work placement represents a new experience for most students, and it is one to which many look forward as being the first step on the career ladder. Reflecting on the proposed situation prior to the placement starting is invaluable, as if the student embarks upon the placement with realistic expectations, not only is he or she less likely to be disappointed, but also, with this outlook the student is more likely to be able to see and take advantage of the underlying benefits of the situation in addition to the more obvious learning opportunities. 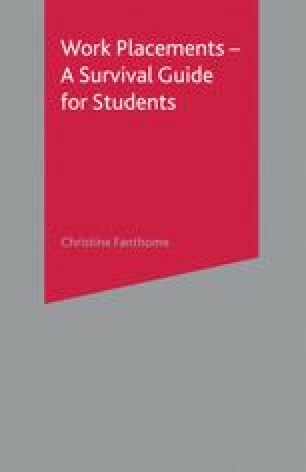 It is essential, therefore, that students take the time before starting the placement to think through their expectations, and if possible to discuss these with their tutor. Talking to previous work placement students about their experiences may also be very useful.